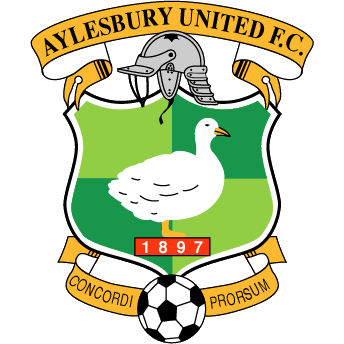 Aylesbury United FC is a non league football club from the town of Aylesbury, which expanded from the 1960's onwards, as housing estates were created for it to become an overspill for residents in London. The club were formed in 1897 following the merger of Night School FC, Printing Works FC and Aylesbury Town FC. After playing in local football United became members of the Spartan League in 1908. They remained there, playing their home games at Turnfurlong Lane, until the became founder members of the Delphian League in 1951. Three years later 'The Ducks' won the title, but a decade after that the league was disbanded with the club joining the Athenian League. In 1976 the club progressed to the Southern League and in 1983 United appointed Trevor Gould as manager, who went on to oversee probably the most successful years in the clubs history. A year later a young local called Cliff Hercules made his debut on his way to becoming the clubs greatest player as he racked up 669 appearances and scoring 301 goals. The team began a run of reaching the FA Cup Round One. The club sold its old home and moved to a new stadium at Buckingham Road. Success came in the league as United were promoted to the Premier Division before going on to become crowned Southern League champions at the end of the 1987-88 season, winning promotion to the Football Conference. Their achievement was celebrated as a full England side took on The Ducks at Buckingham Road in preparation for Euro 88, running out 7-0 winners in front of a full house of 6,000. Round Two of the FA Cup was reached on three occasions, but their Conference spell lasted just one season before they were relegated back to the Isthmian League. Although details are sketchy it would appear that the ground was sold in 1990 to a holding company based in the Channel Islands, paying rent to remain there. Later that year a home FA Cup tie with Walsall was shown live on Sky TV. The money from the ground sale was spent on playing resources, but it did not bring a promotion. In 1992 the club lost an FA Cup Round One tie 8-0 at The Hawthorns against West Bromwich Albion. By 1994-95 Steve Ketteridge had taken over as team boss as he led the team all the way to the FA Cup Round Three. Boreham Wood, Edgware Town, Baldock Town, Moor Green, Newport IOW and Kingstonian were seen off, leading to a home tie with Queens Park Rangers, which was switched to Loftus Road. During the run, the team brought fame to the club with their 'duck walk' goal celebration. In 2001-02 the first round of the FA Cup was once more reached, while the following season United reached the FA Trophy semi-final where eventual winners Burscough ended the run, as Sven Goran Eriksson's England side used Buckingham Road for training. After re-organisation of the pyramid in 2004, The Ducks returned to the Southern League. In 2006 chairman Bill Carroll decided to resign after the Southern League refused his plans to install an artificial pitch at Buckingham Road to try and make the club sustainable after the cash from the ground sale had dried up. The popular local businessman Graham Read took over, but the following year the grounds owners decided not to renew the clubs lease and evicted them as the team were relegated. A groundshare deal for two seasons was signed with the team playing 'home' games at Chesham United. A further relegation was suffered in 2009 to the Spartan South Midlands League with the club by now sharing Bell Close with Leighton Town. A 'Bring the Ducks Campaign' was in full swing, creating much publicity but no concrete plans. 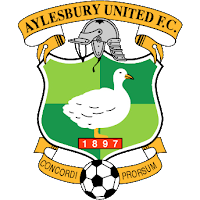 The Aylesbury United Supporters Trust gained control of the club in 2009. At the beginning of the 2012-13 season the local council began to make promising noises about assisting the team to return to Aylesbury and finding a suitable home for the club. Meanwhile the owners looked to convert Buckingham Road into a care home and housing. Further good news came on the pitch after The Ducks finished runners up in the Spartan South Midlands League in 2012-13, winning promotion to the Southern League; where the team were placed in Division One Central under manager Tony Joyce. The team weighed in with mid table finishes in 2013-14 and 2014-15, before Joyce tendered his resignation in October 2015 with the former Wycombe Wanderers and Barnet Football League centre back Glyn Creaser taking over. The Ducks finished a couple of places above the relegation zone in 2015-16 as the club moved from being tenants at Leighton Town to sharing The ASM Stadium with Thame United. Ayesbury ended the 2016-17 campaign in thirteenth position. 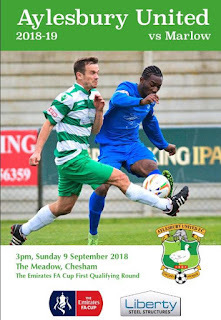 In the summer of 2017 a new deal was signed with Chesham United for United to return to share The Meadow, as their division was renamed Division One East. Aylesbury United FC will play in the Southern League Division One East in the 2017-18 season. I had the day off work, and although I had just about given up the idea of heading anywhere, I woke up in the mood for football and to go somewhere new on such a beautiful day. United were playing at their 'home' in Leighton Buzzard in the FA Vase so to get myself in the mood I thought it only right to head to Aylesbury first and then take a bus to the game. After a visit to the tidy but basic home of the new boys on the block; Aylesbury FC, I continued my walk through the town and head to Buckingham Road. I passed through a sprawling housing estate before arriving at a very sad sight indeed. I walked towards the derelict stadium. The entrance to the car park had been blocked off by concrete barriers, which I clambered over and found myself behind the Main Stand. A wooden fence had been knocked down so I went inside, as the birds scattered from under the stands roof. It was a really strange experience. I got over the concrete wall and onto what was once a football pitch, but was now wild overgrown plants, grass and weeds. The structures still seemed sound under all the greenery. The Main Stand was a single tiered block of seating with the players tunnel on the half way line. Basic cantilever shelters covered the terracing behind the Buckingham Road goal and down the far side. The few rows of terracing went all the way around the pitch. Vandals had smashed down doors to the buildings and done unrepairable damage to any furniture. I went inside a small room at the end of the stand, which I imagined to be the old club shop. A few weather worn programmes and a filing cabinet was strewn across the floor. I walked away in quite a somber mood. I hate people who get old of football grounds for financial gain and leave the supporters heartbroken. I found it even more repugnant when the grounds are left to rot in the hope of gaining planning permission for profitable housing and to make a real asset to the community homeless. I hope such people rot in hell. Anyway, I decided to take another good walk. I made a couple of tweets on Twitter, which the club responded to. They seemed a nice bunch. I recalled the previous time I'd seen United in action was in the FA Cup Fourth Qualifying Round in a 5-0 win at Yeading. They had taken a good following to West London, and we all settled around the TV waiting for the draw for the first round. Scarborough's result was late coming in, and The Ducks fans sat around me seemed genuinely disappointed for me when it transpired we'd lost away to Whitby. Things like that live with you. I was still early for the bus, so I ended up walking to the far end of Bierton, a small village a mile or so outside the northern outskirts of the town. My carraige arrived and I got on board, with a couple of United fans already in their seats, ready for the main event of the afternoon. The bus dropped me off in Leighton Buzzard High Street at 2.30. I decided to head straight to Bell Close, despite passing some mighty tempting pubs on the way advertising cask marque ales. This lodged immediately in the memory bank for post match activities. My afternoon got off to a very pleasant start when the lady on the turnstile saw my Scarborough Athletic rain jacket and told me that her Dad went to school in Scarborough and later had the Pigeon Pie at Sherburn. I gave her my £7 admission fee, which included a programme and went inside the clubhouse for a pint of Tetley's smoothflow. The live game between Preston and MK Dons did little for me, so I went out in the search of nourishment. I had a cheeseburger and chips, which represented decent value for the moderate sized portions. I wandered around the ground before settling behind the bottom end goal expecting to see a glut of goals, despite United missing several regulars for a variety of reasons. 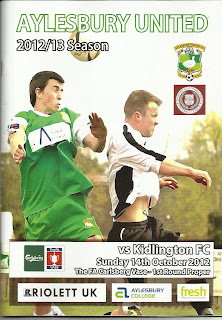 I had seen Kidlington shed in six at Shrivenham in the FA Cup earlier in the season, with some real 'Carry On' defending and goalkeeping. They had a new bigger and more experienced keeper this time and it was making the world of difference, despite The Ducks having most of the play. The visitors took the lead against the run of play when a fine lob from Jack Dunmore after twenty minutes found its way in after a break was blocked. But for a fine save, it would have been two soon after. Kiddy had a physicality about them in their illuminous all orange change kit, while United were laboured in their attempts to break them down. They were so far down to the bare bones that they only had one sub, Stacey Field; who came on after twenty four minutes despite suffering with severely bruised ribs. I giggled as a home fan had a duck quacker which he blew each time the Kiddy keeper took a goal kick. The away teams bench and following of around thirty fans were getting a little upset by the actions of Aylesbury's forty one year old player boss, Tony Joyce; who was making his first appearance for two years. First of all I thought he looked a real jolly character, but he knew all the tricks in the book and would have driven me round the bend if he'd been playing aganst Scarborough. A great line came from the Kiddy bench after the aging ref gave Joyce's side another decision. "You don't have to give him everything ref just because you're the same age" and then "just give him the whistle" after another free kick went against them. Field gradually grew into the game, while Joey Acheampong who started off well. quickly went off the boil. The pitch was tight to the surrounding fence, which made it a better spectacle and made me feel like I was part of the action. At half time I was just six numbers out on the 50/50 draw, which the first prize was £44. It was announced by the excellent tannoy man that the Aylesbury Vale Council were discussing the potential for The Ducks to go home at a meeting the following Wednesday, with all fans encouraged to attend. To much joy from the visitors, Joyce talked his way into the referees notebook shortly after the restart. There were further ironic cheers when the man in black gave Kiddy a free kick. 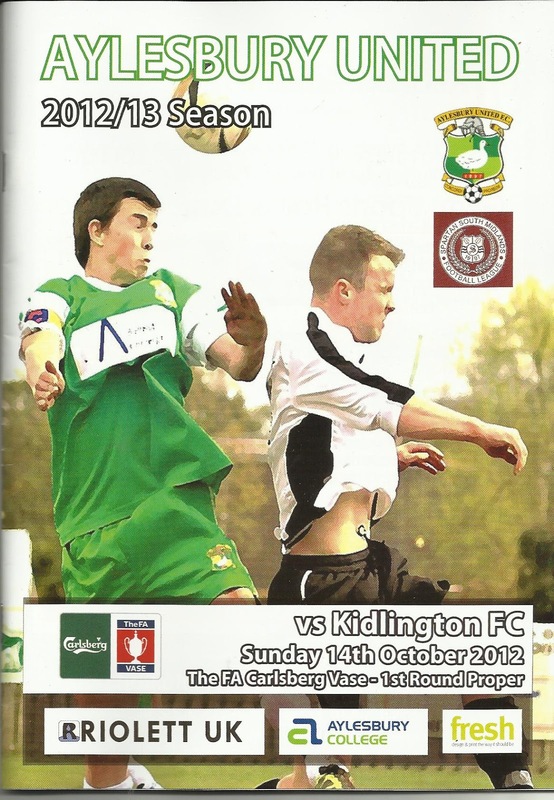 Kidlington doubled their lead when Jack Sillitoe in the home net flapped with the ball going in from Ryan Curtin. The game became stretched as United tired and Kiddy had the advantage of using three subs. Matt Dixon in the visitors goal was using all his experience, as well as an unhealthy dose of play acting after a harmless brush when taking a cross. The Aylesbury faithful were not happy. Half chances came the way of their favourites but the ball wouldn't go in. A shot rattled the foot of the post, which was as close as they got. By now some of the humour had dissipated into plain tiresome whining from both sides, but particularly from Kiddy. The Oxfordshire side could have added to their tally, but a mixture of bad luck and rank bad finishing kept their tally to two. Joyce, who had generally pushed his luck and played along like he was a close pal of the ref, went one step too far and was given a second yellow for a niggly foul too many. The roars of joy from the visitors was as loud as for their goals. Joyce simply jumped over the perimeter fence and stood and watched the remaining few seconds. I expected the Kidlington contingent to be happy at full time, but their celebrations were a little over the top. I personally think that you can be good winners as well as good losers, but they had crossed the line. I walked back to the station past all the tempting pubs. The weather had grown cold and I wanted to get home. I was back in my Kingsbury flat before 7pm having had a good day out, and hoping for a return to Aylesbury for The Ducks in the near future. After feeling ropey for a few days I needed some exercise and fresh air. This fixture fitted the bill perfectly, as I’d yet to see The Ducks at their latest shared home, and going to Chesham is a good trip out. My pal Steve Barnes agreed to head along with me. We took the Metropolitan line into Buckinghamshire and walked down the quiet main East Street to the pleasant Chesham Brewery Shop, where we sampled a couple of pints before heading round to The Meadow as the rain began to fall heavily. Admission was £9, with programmes sold out on our arrival. A fan in the bar allowed me to take an image. We enjoyed a pint of Generals Bitter; brewed for Chesham United by the Rebellion Brewery of Marlow. It got the thumbs up from the pair of us. We decided to take up a seat in the stand for the first half. A few fans had travelled from Sudbury; which was commendable, as their side as well as Aylesbury’s was languishing towards the wrong end of the league table. The last time we’d seen Sudbury was the previous season when their match at Hendon had been abandoned as it entered into stoppage time, after two large melees had broken out. Their tactics on this occasion weren’t the most subtle as the forward taking the kick off, aimed the ball straight into touch as close to the corner flag as possible. I’d never seen such a tactic before and was half expecting to see the teams set up for a line out. United played some nice stuff on the wet pitch with a strong crosswind offering another obstacle in the opening stages. Sony French went close with a low shot before the man mountain Tyriq Hunte lofted a tremendous shot over keeper Paul Walker to make it 1-0 on five minutes. Ollie Hogg also went close for the hosts, before ‘The Suds’ began to get into the game, as a rather vociferous but indiscifible away fan shouted all sorts from the front row of the seats; to much shaking of heads from other Sudbury fans. The visitors had a couple of efforts before the Ducks had half a chance to double their lead. However, it came as no shock when Sudbury drew level as Jack Clowsley shot home from twenty five yards to give Jack Silitoe no chance in the home net. Decent defending denied Ollie Dunlop from putting Sudbury ahead, as the back four atoned for the mistake that put the forward in. The team went off level, as we headed round to the far covered terrace for the second period. After the break Aylesbury once again began well and had a couple of chances. The rain had abated, but the wind blew across towards us before it changed direction slightly so it was at United’s backs. On sixty three minutes Sudbury took the lead as a low shot rebounded off the far post before Jamie Eaton-Collins reacted first to make it 2-1. The visitors looked most likely to add to their tally as the game entered the closing stages. By this point we’d got chatting to a couple of Aylesbury fans who enjoyed the game but also had senses of humour. They regaled the sad tale of being a nomadic club and were not at all optimistic about the chances of their club returning to their home town. Ducks manager Glyn Creaser rang the changes and sent players forward in the hope of grabbing an equiliser. Sudbury’s defence were doing their best to hang on as the home side nearly took the game into extra time in extraordinary circumstances. Keeper Stilitoe went forward for a corner and as the ball dropped he hooked a shot towards goal. The ball hit the top of the crossbar and went over the bar. The Suds defended another corner before the referee blew his whistle for full time. Steve had done his homework. Instead of going back the same way, he’d seen an alleyway on Google maps that took us behind the stand and down some very pretty old school streets to the Queen’s Head pub. The Brakspear Bitter was overpriced, but the pub was an absolute gem, with its several rooms all with history oozing from everywhere. After a pint we wandered back in time for the 10.23 train back to Wembley Park and then Kingsbury; where we rounded off an excellent evening. I’d given up my chance of watching Hendon in FA Cup action the previous day in order to have a brilliant day out playing for Wenlock Arms CC and attending the Chappel Beer Festival in deepest Essex. It’d been a long and rather fluid day, so when my pal Tony alerted me of the Sunday game at The Meadow it seemed a good idea to get some fresh air into my lungs, even if it did take a bit of initial effort to leave the chair and the Test match at home. There was certainly never any question of me partaking in pre match ales, despite the attractions of the fine micro pub on the way to Amy Lane. I was struggling and going to meet my good friend Fred who was down for work after the game. Admission was £9. I’d downloaded the free programme online before departure and then bought a decent hot dog with onions for a couple of quid to keep me going. Tony was over the far side on a very pleasant afternoon. It quickly became apparent that the pitch was grassy but firm with the wind blowing down the pitch from the Meadow End. United had an early opportunity when Max Hercules controlled a long ball superbly, but his weak shot failed to trouble Marlow keeper Simon Grant. Jordan Brown broke clear for Marlow in the twelfth minute but was brought down on the edge of the box by Aylesbury custodian Jack Hopwood. Fortunately for the hosts, referee Farai Hallam decided just to show a yellow card. This was met with howls of protest from the Marlow players. I’d read on the Non-League Matters forum from someone who’d seen them in action that they were continual moaners. He wasn’t wrong. It hardly stopped, especially from Grant, while Brown never stopped niggling. Ten minutes later Jack Kerrigan came close to opening the scoring for the visitors, but his header was scrambled away from the line. Hercules was brought down near half time, with the ref deciding the challenge was outside the box, despite protests from United players and fans. The resulting free kick was headed downwards by the unmarked Jeanmal Prosper, only for Curtis Chapple to affect a superb headed clearance onto the crossbar and away to safety. It wasn’t a bad half of football in which I’d quickly decided I wanted Aylesbury to win. A couple of minutes after the restart Marlow came close to breaking the deadlock as Kameron English fired in a superb shot from twenty five yards with the wind at his back that smashed off the crossbar with Hopwood well beaten. The game became very scrappy and low on quality. Challenges were flying in, met by more moans. Brown looked a decent footballer, but he was becoming the pantomime villain as he continued to foul and generally become a pest. The Blues Kelvin Bossman was denied by a brilliant last ditch challenge from Callum Mapley before substitute Ben Seaton threaded through a lovely pass for United’s Sonny French who was denied by Grant. French looked about Aylesbury’s best footballer to my trained eyes. The hosts continued to defend well, with another goal saving challenge keeping them in the tie. The final action saw Bossman’s glancing header go across the goal to bring to an end a disappointing game that deteriorated as it went on. Tony was kind enough to drop me at Amersham station for me to take the Chiltern train to Marylebone so I could meet up for beers at Kings Cross and Camden.